Peter Keating says that in the foreign policy sphere, there’s only one ruler of the roost in the Obama administration: Hillary Clinton. position of Deputy Secretary of State into two jobs: supersmart Jim Steinberg, who was deputy national security adviser under Bill Clinton but supported Obama in 2008, is her policy maven, while Jack Lew is her management chief. Lew helped Hillary secure a 10 percent increase in the State Department’s budget from Obama while Tim Geithner was still figuring out how to turn the lights on in his office. ….Meanwhile, nobody else has developed an alternative foreign-policy power center within the administration. 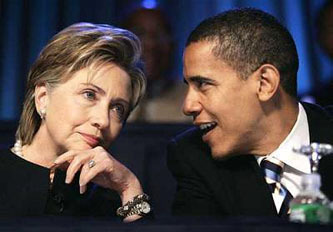 Obama likes Biden, but the vice-president is no match for Hillary in mano-a-mano bureaucratic combat. For example, Clinton favored sending 21,000 more troops to Afghanistan, while Biden opposed the move. The result: “She crushed him,” according to Republican Mark Kirk of Ilinois. At the same time, National Security Adviser Jim Jones has been an utter cipher; when Time’s Mark Halperin graded the Obama administration, he gave Hillary an A- (“significant, powerful, worldly, respected”), but had to give Jones an “incomplete.” And Obama’s presidential envoys, such as Richard Holbrooke in Afghanistan and Dennis Ross in Iran, are mostly old Clinton hands who aren’t about to usurp any authority from Hillary. Read the rest. He makes a persuasive case.